Also serving communities of Holstein, Correctionville. Caring.com has helped thousands of families find high-quality senior care. To speak with one of our Family Advisors about assisted living options and costs in Cherokee, call (855) 863-8283. Located in the Little Sioux River Valley in Iowa, the city of Cherokee is home to the annual Jazz and Blues Festival and other cultural events. Seniors who want to move to this vibrant city and need some assistance with daily living can choose from two available assisted living facilities. 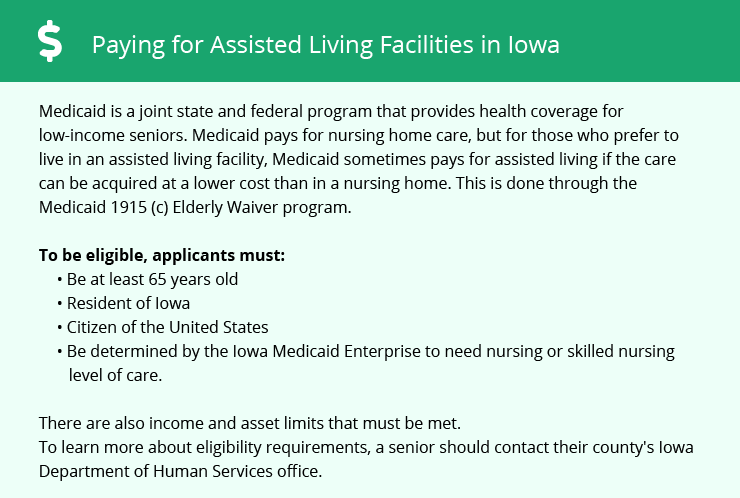 These are referred to as Assisted Living Programs in Iowa and are licensed by the state’s Health Facilities Division of the Department of Inspections and Appeals. The Siouxland Regional Transit System provides efficient public transport services to Cherokee residents. Reduced elderly fares for 60 and over can be arranged through the Siouxland Aging Services, while personal care attendants can ride free of charge. Buses are ADA-accessible, and drivers provide passenger assistance. These policies ensure convenience for elderly commuters. Cherokee has an array of community resources for seniors, including The Good Times Place Senior Center, a facility that offers group activities for residents 50 years old and above. Activities include painting, crafts, day trips and monthly potlucks. The Cherokee area is home to world-class medical facilities, including the Cherokee Regional Medical Center, in the event of medical emergencies or illness. Cherokee’s overall cost of living is listed at 77, well below the national average of 100 and Iowa’s average of 90, making the city one of the more affordable locations in the state. Housing costs in the city, at 41, are less than half the national average, while healthcare costs, at 119, may mean that seniors can expect to spend more for their regular medical care. Compared to the national comfort index of 54, Cherokee receives a score of 27 out of 100. Winter months are generally cold with an average low temperature of 8 degrees and snowfall of 36 inches per year. Freezing temperatures may be uncomfortable for some seniors and limit their outdoor activities. On the plus side, the city enjoys an average of 211 sunny days per year which are conducive for seniors’ leisurely outdoor walks. Cherokee seniors get to take home a sizable portion of their retirement income with Iowa’s moderately friendly income tax policy. Although retirement account withdrawals and pension income are partially taxed, Social Security income is tax-exempt. Assisted Living costs in Cherokee start around $0 per month on average, while the nationwide average cost of assisted living is $4,000 per month, according to the latest figures from Genworth’s Cost of Care Survey. It’s important to note that assisted living rates in Cherokee and the surrounding suburbs can vary widely based on factors such as location, the level of care needed, apartment size and the types of amenities offered at each community. Eligible Cherokee seniors in community-based settings may utilize individual comprehensive plans designed by an interdisciplinary team. These plans are granted through the Medicaid Home and Community Based Services Elderly Waiver and managed by the Iowa Department of Human Services. Cherokee and the surrounding area are home to numerous government agencies and non-profit organizations offering help for seniors searching for or currently residing in an assisted living community. These organizations can also provide assistance in a number of other eldercare services such as geriatric care management, elder law advice, estate planning, finding home care and health and wellness programs. To see a list of free assisted living resources in Cherokee, please visit our Assisted Living in Iowa page. Cherokee-area assisted living communities must adhere to the comprehensive set of state laws and regulations that all assisted living communities in Iowa are required to follow. Visit our Assisted Living in Iowa page for more information about these laws.